The fact the Canada Pension Plan Investment Board (CPPIB) had $200 million lying around to plunk down on a real estate play is hardly news. The real headline in the pension plan’s recent announcement is that it marks its first foray into industrial real estate. The pension fund is taking part in a joint venture with WAM Development Group and Walton Group of Companies to develop a 250-acre industrial site in northwest Edmonton named Henday Industrial Park. The partnership plans to build four million square feet of distribution and logistics warehousing on the land, which is situated within the 2,500-acre Winterburn Industrial Park. Henday Industrial Park will be created in two phases, with phase one expected to break ground this summer. The plan’s $200-million outlay will give it an 85 per cent interest in the joint venture. A CPPIB spokeswoman confirmed that the giant pension plan, which has $21.9 billion in real estate investments (predominantly in retail and office), has long looked at the industrial sector, but has been waiting for the right deal to come along. “We have looked in the past, but this was just a good opportunity that met our particular investment criteria,” the spokeswoman said. CPPIB’s preferred real estate play is to provide the funds for a venture and let its partners supply the operational expertise. She added that the pension plan, which has more than $200 billion in assets and 18 million Canadian contributors and beneficiaries, will look to expand its portfolio of industrial real estate investments in the future. “I think we will certainly be interested in looking, yes,” she said. Prospective CPPIB dance partners might be advised to consider one critical factor: size does matter to the country’s largest pension plan, which has massive funds and a preference for big deals. So expect CPPIB to be looking for jumbo-sized investments like its Edmonton industrial venture. Edmonton, one of the hottest industrial real estate markets in the country, certainly qualifies as strategic. Walton is one of the most active industrial developers in Edmonton, with approximately 7,000 acres, 5,744 acres of which are pre-development land and another 1,203 being actively developed as of last fall. 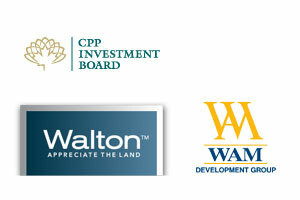 Walton is the primary developer of the city-initiated Edmonton Energy and Technology Park, a 12,000-acre property on the northeast edge of what is referred to as Alberta’s Industrial Heartland. It is the country’s largest hydrocarbon processing region and home base for more than 40 companies in a variety of sectors, including producing and processing of oil, gas and petrochemicals and of advanced manufacturing. The Henday parcel appears to be sited in a good spot. “The property is strategically located within an existing full-service industrial development and in close proximity to major transportation corridors servicing Edmonton’s growing industrial market,” said Bill Doherty, CEO of the Walton Group. The property is located within the Winterburn Industrial Park, a full-service industrial development with access to Yellowhead Trail, the major east/west transportation corridor in Edmonton and Anthony Henday Drive, the ring road for the Edmonton market.